Stress balls in the shape of a carrot, we really have thought of everything! An orange carrot with green stalk. 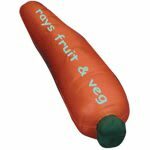 The carrot stress balls make great promotional items and like all of the stress balls that we have on offer can be printed with your company logo or message. The carrot stress balls are made from soft PU foam and provide hours of squeezy ball fun. These carrot stress balls are just one of the many vegetable stress balls that we have available. Vegetable stress balls have never looked so good!